Kuala Lumpur is a big, bustling metropolis littered with tall buildings and many modern structures. Surprisingly, in the midst of all this concrete, glass and metal, the city in fact hosts several lush patches of green like the Lake Garden complex, the KLCC gardens, the Titiwangsa Lake Gardens and the ancient rainforest enclave of the Bukit Nanas Forest Reserve. 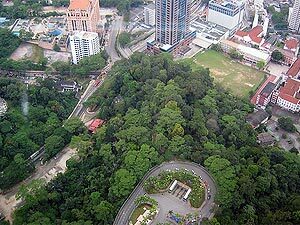 The last mentioned Bukit Nanas Forest Reserve is the city’s very own patch of rainforest, which extends over 10 hectares and is located at the foot of the KL’s landmark attraction, the Menara KL (KL Tower). The Bukit Nanas Forest Reserve may be a small green lung but even then it is home to a wide variety of native flora and fauna, like two species of monkeys, namely the Silvered Langur and the Long-tailed Macaque, along with various species of birds, squirrels and snakes. Additionally, the reserve which dates back to more than a century, also hosts a rich variety of flora in the form of various creepers, ferns, tall bamboo grasses, climbers and rare herbs. Tall tropical trees belonging to various local species like Keruing, Chengal, Meranti and Pulai also grow in lush abundance within the reserve. 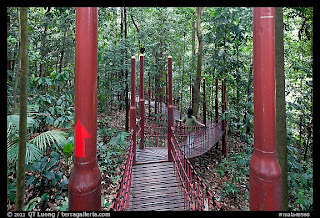 The Bukit Nanas offers visitors a chance to experience a typical rainforest environment right in the heart of Kuala Lumpur itself. So if you don’t have time to visit Malaysia’s famed Taman Negara rainforest, you can definitely get a sampling of virgin rain forest terrain by paying a visit to the Bukit Nanas Forest Reserve. The reserve offers free public access daily from 7 am to 7pm all year round. Also on offer are free daily guided nature tours available four times a day. Do contact the reserve’s onsite Visitor Center for details about timings. Fitness enthusiasts and joggers will be happy to learn that the Bukit Nanas Forest Reserve is peppered with many clearly marked walking trails and an outdoor obstacle course Other attractions within the reserve include well-identified bird-watching spots and free camping facilities for those visitors who wish to have an outdoorsy jungle experience in the heart of a big, bustling city with the sounds of traffic and urban noise shut out. 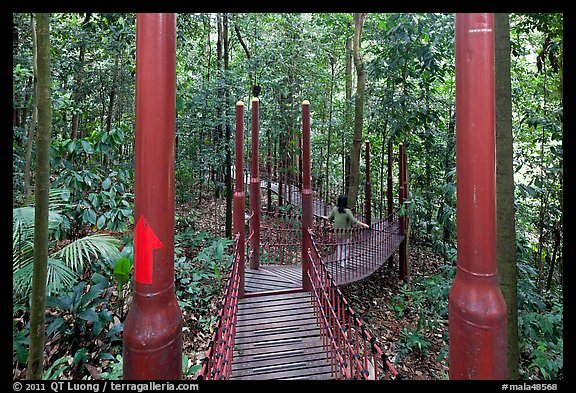 So if you wish to be one with nature on your trip to Kuala Lumpur, the Bukit Nanas Forest Nature Reserve offers you ample opportunity to do so.